His feet carried him over the rough terrain of Kodiak Pass, brush and brambles tugging at his thick fur and pulling away clumps of it, leaving behind evidence of his path. Dipping his nose to the wet earth, Reblin paused to confirm he was on the right track and then, kicking off the sodden ground with his back legs, the Comte lurched forward again. Comfortable in his Lupus form, Reblin passed beneath the tall, thick canopy of the forest without a single glance upwards. His sights were on one thing and one thing only: a deer. He had been tracking the thing for only a short time, having passed its scent while out hunting rabbits. There was a rancid smell about it that encouraged him to give it a shot, for it seemed to him that the deer was suffering from some sort of ailment. If the thing was already weakened, maybe he could take it down on his own. Anyway, he wouldn't know unless he gave it a try. So, following after its scent, Reblin passed through the forest with no thought to the trees around him. He wasn't immediately aware of the wrenching, ripping sound until it was joined with a sharp cracking. Slowing his pace, Reblin scanned the forest around him frantically, feeling a growing sense of unease that the sound only seemed to growing in intensity. Almost too late, the wolfdog looked up and ran. "Ohshitohshitohshitohshit," he huffed in a repetitive mantra, tucking his tail tightly between his legs and throwing all other caution to the wind. Nothing could be worse than having a tree fall on you. Behind him, the tree completed its unwilling descent and fell with a rumbling crash to the ground, taking the limbs of some of its neighbors down with it. Panting heavily and quaking a little from adrenaline, Reblin turned to look at the thing that had nearly landed on him and forgot entirely about the deer. This was better! He could tell Harrison about this fallen tree and maybe get in his good graces! Sitting at the tree's side, the smell of wood and leaves filling his nose and replacing all memories of the deer with its fresh aroma, Reblin looked the thing over and counted himself lucky. Two very different instincts warred in Dreyma -- but while she heeded the urge to run, the second called her back to the little den in the valley. She pushed past this as she pushed past the thick vegetation springing up in the once-charred woods, her legs singing praises for the open land, her lungs sucking in fresh air. She would feel even better if she swam or hunted, she thought; the aroma of blood or riverwater would wash away the cloying scent of puppies and milk. Squeezing under an old log, she reveled in the feel of wet, rotten soil on her belly rather than the increasingly-toothy mouths of babes. And yet hormones tugged on her heartstrings until the beat went erratic. She did not want to leave the puppies. She had to leave the puppies. They were not her puppies. A distraction: her mind seized the opportunity of deer, and the black wolf trotted through the forest after its tracks. When she smelled a packmate, she wagged her tail, and fell into his pawprints with the ease of her ancestors. Then her ears flickered at that telltale crackle. Her head jerked up as a denizen of the forest groaned, then toppled. Its branches still shook from the impact, its leaves rustling, when Dreyma had bounded over to make sure the other Courtier had not been hurt. Thank the gods, he had not. Are you okay? she continued, approaching and sniffing him closely. Reblin, she thought his name was; she knew him by his association with his sister rather than personal knowledge. The environment of the Court -- and state of her mind -- had not been kind to the prospect of socialization, something she found herself regretting a little. Sitting down beside him, she too looked at the branches, and let out a low whistle. Close one. There was a sound of relief and Reblin took his eyes off the tree. "Oh, Dreyma!" He gave a short, low howl and allowed the dark wolf to sniff him while his tail thumped the forest floor. Though he had not met her personally, not in the same direct way that he had met many of his other packmates, he knew her from funerals and trials and executions... all the things that were wrought with tension and misfortune and grief. The thumping of his tail stilled and he looked back at the tree. This might have been another one of those moments, had luck not been on his side. "I know, right?" he agreed emphatically, turning to look at Dreyma again. Reblin shifted his body more directly toward her, scooting and shuffling his feet across the soil without standing. "I was tracking a deer and then CRACK. I was almost squashed!" For someone who had almost been killed, Reblin didn't sound terribly affected. "I guess the gods like me." He grinned and wagged his tail again, thinking that Harrison was going to like him a little more too, once he found out about this. As they sat together in front of the fallen tree, Reblin caught whiffs of her motherhood and felt a sense of comfort and calm. "Hey," he began, canting his head. "How are your puppies?" His tongue flopped out of his mouth as he smiled. Before coming to the Court, the feral wolfdog had never been exposed to the birth and growth of puppies. But it did not take him long to discover how much fun they were. And, though his own mother had never expressed much interest or affection toward him or his brother, Reblin couldn't imagine that anyone else felt the same way as Ayrin did. Reblin shuffled his feet and rear through the loam, exclaiming agreement and babbling on breathlessly about the near-fatal incident. His enthusiasm made Dreyma’s ears pop up in surprise, as she expected him to be a little more… traumatized, or at least abruptly cognizant of his mortality. However, she couldn’t help the amused smile from slipping over her face next, brightening her eyes and quirking her mouth. She could see why Thyri kept the lad around. “Or they don’t like you and wanted to give you a fair warning,” Dreyma joked, raising her brows and lolling her tongue. His question made her mouth click shut, and she self-consciously glanced down at herself then averted her eyes. Expression shifting with shame, discomfort, and regret, she took a moment to answer – and even when she did, she switched gears quickly. She cleared her throat. Then she stepped over to the tree and began to sniff and scratch under it, and doubled back to where the breakage had occurred. She hadn’t heard any strong winds; it seemed that the seasons of decay had caught up with the giant. Little insects crawled out from the chipped bark in frantic lines. Her brow furrowed. Abruptly, the wagging of Reblin's curled tail stilled and he stared at her fearfully. Where his near-death experience hadn't been, Dreyma's suggestion that the gods didn't like him after all was taken seriously. "D'you... d'you think so?" he asked, his pale eyes wide. That was one possibility the wolfdog hadn't considered. He didn't like being disliked, especially not by the gods. He looked back at the tree and wondered. He shifted the conversation to puppies, watching as Dreyma glanced away. She did not answer immediately and Reblin pulled his pink tongue back into his mouth and thought that maybe he had said something wrong. When the dark mother did reply, his worries were soothed and he offered her a gentle thumping of his tail. 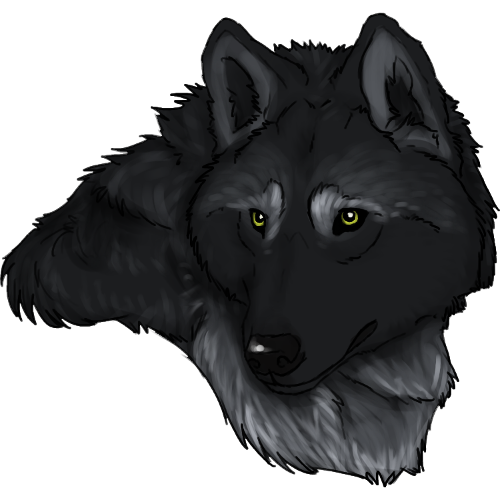 A more perceptive wolf might have taken note of the negative expressions in her eyes, or of the sparse information she provided about her children, but Reblin did not. "Sure! My brother, Torrin," he replied, watching as Dreyma investigated the falling tree. He rose to his feet and followed suit. "He was kind of a jerk, actually." He laughed a little at this, though it lacked any humor. The brothers had never been particularly close. "What? No!" Reblin was relieved at the change of subject, latching onto it with eagerness. He grinned. "That doesn't surprise me. She's kind of a brute." But there was affection in his voice. Reblin felt closer to Thyri and her family than he had ever felt with his own. Looking the tree over, the young wolfdog felt his thoughts wander. "Do you ever, like... wish... ya know..." His eyes fell to a shiny, black beetle but it offered him no help. He sighed, the sound of it not unlike a frustrated growl, and dropped his rump into a hard sit. "Like..." Another fleeting pause and he looked at Dreyma. "That things were different? Like, when you were little? I mean..." He glanced away again. He hated this subject. Why was he even talking about it? After a moment of silence, Reblin forced a smile to his face and he grinned back at Dreyma again. "What am I even talking about? I don't even know what I mean!" He laughed. "Maybe a knock to the head with a tree would've been good for me after all!" His smile crinkled the corners of his eyes but it did not feel genuine. "Speaking of the tree, I bet we could use it for some of our new houses, don'tcha think?" Reblin's tail ceased wagging and his expression changed all at once. He seemed to take her joking seriously, and Dreyma quickly wagged her own tail and sneezed to show she had only been teasing him. No, Reblin, I don't really think so. She couldn't imagine even the wild gods smiting a soul for no reason; honestly, she thought that if the gods were real, they turned a blind eye to the affairs of mortals. If nothing else I'd say the tree is one of Loki's tricks, she added with a laugh and a wink. It would be like the shapeshifter to scare the fur off someone like that. The piebald hybrid padded after her as she sniffed along the tree. She twisted her ears back to listen to him as he mentioned his brother and teased Thyri, but then his words began to trail into lapses of silence. Concerned, Dreyma glanced over her dark shoulder, then cocked her head at his strange, vague question. It remained at an angle until he grinned, dismissing his words with a self-deprecating remark, and Drey exhaled slowly. Well, if it fell due to rotten wood and insects, we don't want to build with it. She took a few more steps, scrutinizing the trunk. Closer to the branches the wood might still be good, maybe. I would have Harrison look at it. He would know whether the wood was safe to use, or if it would cause problems for the housing down the line. The black wolf sat down then, lifting her green eyes to the sky. About what you said... Yes and no. Rebel had dropped the subject, but Dreyma meant to carry it on, her tone gentle. Yes because there are always things in your past you wish you could change, or that made you unhappy or made life difficult. No because – well, everything that ever happened led you here to where you are now, y'know? She glanced at him and smiled. You're happy here now, aren't you? If things were different when you were little, do you think they would be the same in the present? His relief was palpable. "Oh good," he breathed out, his body relaxing enough to allow his tail to carry on its cheerful cadence again. He considered her suggestion that it was likely Loki with a thoughtful glance upwards. He was familiar with the Norse gods through Thyri, though his knowledge was basic at best. He was thankful that Dreyma included a hint of what Loki was known for. "Yeah, that was probably it." Reblin gave the tree another glance and nodded decisively. Lapsing into intermittent moments of silence and staggering sentences, the piebald Courtier kept his eyes averted as much as possible, only occasionally lifting to the woman's dark face. This was a subject that left him feeling inadequate and sad, so he largely avoided it. But, sometimes, it felt much too big to be kept contained and, during these moments, it often seeped through the cracks of its cage and spilled out into the open. Reblin's ears drooped when Dreyma suggested that the wood might be rotten, potentially rendering it useless to Harrison after all, but was silently glad that she had accepted the change of subject. "Crap," he pouted theatrically. "Are you saying I was almost squashed by a tree for nothing?" he asked, quirking his lips upwards playfully. He lifted his eyes away from the tree to look at the dark Courtier, then back down at it again. He nodded. "Yeah, I guess," he said, more seriously this time. "Harrison would know." And then, just when he felt secure that his earlier sputtering was going to go unnoticed, Dreyma steered the conversation back around. He lifted his ears when she began to talk, and then flattened them again just as quickly. Reblin listened to the woman talk with his pale eyes firmly at his feet. He could feel her eyes on him and, after several heartbeats, finally lifted his own. "I... I mean, yeah, I'm happy now. It's just... I guess..." Reblin glanced away again. "I don't know." He felt oddly defeated and at a loss of how to articulate what he was feeling. "I think, when I was little... I think I was a burden. Like..." He laughed humorlessly. "My mom? I don't... think that she, like... liked me." His glance at Dreyma was quickly averted again. "It kinda sucked." He paused a beat. "And then, when I met Thyri... And Shiloh was so..." Thinking about Shiloh hurt. "Well, your mom was awesome. And I bet you're an awesome mom, too. I guess that's what I'm trying to say!" Reblin smiled but it lacked its usual brightness. "I wish I had an awesome mom. He looked at Dreyma again. "But you're right, I'm happy now. Stuff in the past doesn't matter, right?" He wagged his tail optimistically but his heart was not convinced. OOC: <333 He's got some mama baggage. :c In other news, every time I type Dreyma's name I try to add an 'n' at the end. >:/ "Dreyman" every. single. time. lololol. ooc: It's okay, Dreyma is the mama baggage. And I think we can wrap this up since it's older! The once-riant youngster averted his gaze and dropped his ears, his demeanor changing in an instant. He stammered indecisively, then brought up the past that he seemed to regret -- mentioning a mother who didn't like him, who made him feel like a burden. He contrasted kind Thyri and maternal Shiloh -- and Dreyma, too, who flinched. She did not mean to flinch, but the dark wolf wore her heart on her sleeve, and her heart was more and more uncertain as the weeks went on. She felt like a different person; before her pregnancy, she was confident and independent, but now she felt torn between her freedoms and her loyalties. It was strange how two small furballs that could hardly talk would alter her life and make her, too, regret the past. "I didn't say it didn't matter," Dreyma replied. "It still formed you. You still have feelings about it, and I think that's okay. Sometimes it's just... easier to focus on where you are now than feel bad about the journey that brought you here, you know?" It was her turn to glance aside, wondering -- would her kids grow up thinking that she didn't like them, that they were a burden to her? Or would it even matter? They had Skoll, didn't they? She planned from the begining to be out of their life before they could make connections: a friendly aunt on the sidelines. Right? "We should go find Harrison, I think," Dreyma added, standing and reaching out to bump her head against Reblin's shoulder amiably. Changing the subject would probably be easier for both of them. Gods knew they had enough to think about already. Chattering away as he was, Reblin didn't notice how Dreyma flinched. When he lifted his pale eyes in her direction again, she appeared as normally as she always had to him. His tail, curled over his umber back, waved in the open air cheerfully despite what he felt in his heart. But as the dark woman responded to his words, its cadence rapidly slowed. "Yeah," he admitted, quick to avert his pale eyes. Though he didn't know what good it was, or precisely how it had formed him, he couldn't confidently deny that his upbringing mattered... particularly not when Dreyma offered such a good argument. "I guess that's true." For a stretch of time that could have been mere seconds, or lengthy minutes, the pair of them seemed consumed with their thoughts. But why?, he thought unhappily, his eyes on his toes. Why is that kind of journey even a thing? What kind of mother couldn't love her child? It was this that gave Reblin pause. Biting gently at the tender flesh of his cheek, he looked with unfocused eyes at the dirt against his feet until Dreyma's voice pulled his away from his thoughts. 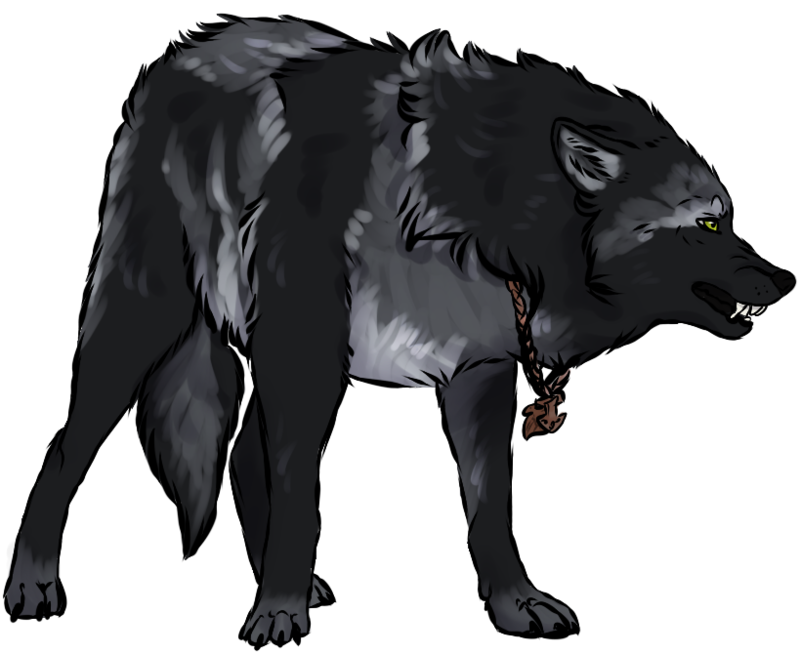 Blinking rapidly, he looked at the dark woman and then nodded with a violent wagging of his tail. "Good idea!" he barked, accepting Dreyma's headbutt willingly. Just as abruptly, his past thoughts were left in the dust. "I have an idea where he is. Follow me!" And, without waiting for approval, the pied wolfdog bounced cheerfully away from the fallen tree. OOC: Yeeee. We end hurrr.